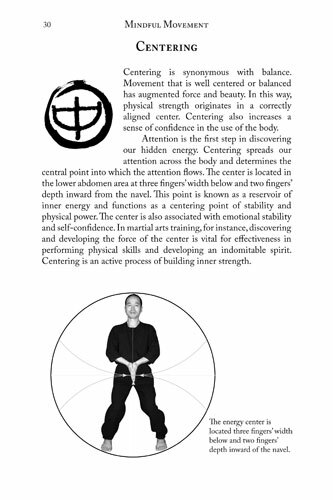 Mindful Movement: Mastering Your Hidden Energy is a guide to invigorating your internal Ki energy flow through a unique sequence of 12 movements (MBX-12) targeting the 12 meridian energy channels. MBX-12 brings together mindful movement and deep breathing to create an active form of moving meditation. As you learn the exercises that make up the MBX-12 routine, you'll develop an understanding of the mindfulness practice principles of attention, centering and release. Sang H. Kim introduces the movements of MBX with step-by-step practice guidance, focal points, self-assessment criteria, wellness applications and detailed explanations of how mindful movement influences your inner energy flow. You'll also learn 13 MBX Mudras, symbolic hand movements that activate the 6 meridians in the hand and affect energy flow across the body. Throughout the book, short readings introduce you to the four pillars of energy transformation: mindfulness, movement, breath, and meridians. For experienced mind-body practitioners, MBX-12 is an excellent supplement to other mindful movement practice such as Yoga, Taichi, and Qigong. MBX-12 integrates your moving body with your breath, redirects energy flow along the 12 meridians, and unites the mind with all in the present. Power Breathing is an excellent way of improving lung capacity, strengthening the core muscles of the torso, increasing stamina, reducing stress and channeling inner energy. It's principles can be applied to martial arts training, yoga, tai chi and many aerobic sports. Sang H. Kim teaches you breathing exercises that you can do anywhere, in as little as sixty seconds, to increase your fitness level, tap into your internal energy and increase your inner power. New to breathing exercises? Start with Gentle Breathing, a simple way to reconnect with your body. When you're ready, the core Power Breathing exercises of Steady, Staccato and Explosive breathing combine to create a total body energizing workout that will leave you feeling refreshed and revitalized. Finally, give attention to problem areas with Healing Breathing – ten exercises to release tension and promote flexibility through controlled breathing. Beyond the exercises and workouts, this book also explains how and why Power Breathing works and how you can get the most out of your breathing practice. It includes variations to make the exercises less strenuous or more challenging depending on your fitness level and walks you step by step through each breathing method using photos, illustrations and easy to understand instructions. This collection of inspirational passages and anecdotes blends the common-sense thinking of western philosophy and the mystical wisdom of eastern disciplines. It is based on the belief that our journey through life is most peaceful and fulfilling when we learn to recognise and take charge of our chosen destiny, knowing when to direct the flow and when to yield to it. Organised in an easy-to-read format and grouped by subjects such as truth, chaos, freedom and wisdom, this book encourages each reader to freely discover his or her own road to inner harmony.